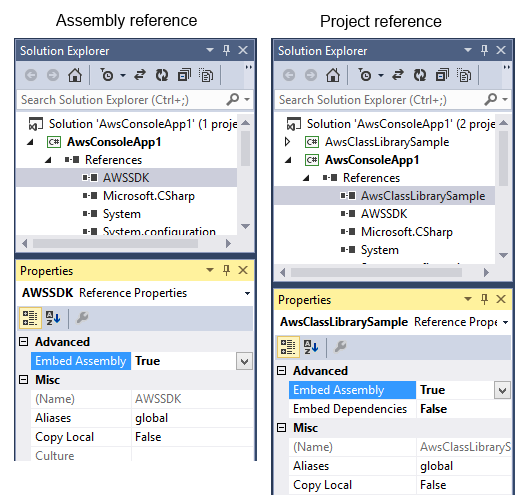 Vitevic Assembly Embedder allows merging any referenced assembly into the main assembly as embedded resource. Using this tool you can seriously simplify your deployment process. Fully integrates to Visual Studio (2010, 2012, 2015, 2017) and MSBuild. Works for libraries and WPF applications. You can specify what references you would like to embed. Project Reference (a reference to a library project in the same solution). Plus, it can automatically detect all the library project dependencies and embed them too. And embedding is done during MSBuild process. Visual Studio 2017 support. If you have several 2017 versions (Community and Enterprise, for example), the latest install of the highest version will be used during installation. Visual Studio 2015 support (including Community edition). Assembly Embedder MSBuild extensions can be installed separately on any build server like TFS or TeamCity. 2014-2015 © Vitevic. ALL Rights Reserved.